Chuck Waldron, author of the action adventure novel, Tears in the Dust, is stopping off at Pump Up Your Book on Day 6 of his virtual book tour with Pump Up Your Book! Watch a video interview with Chuck and Pump Up Your Book at http://www.pumpupyourbook.com/2011/12/11/author-vids-fantasy-author-chuck-waldron-talks-to-pump-up-your-book/! 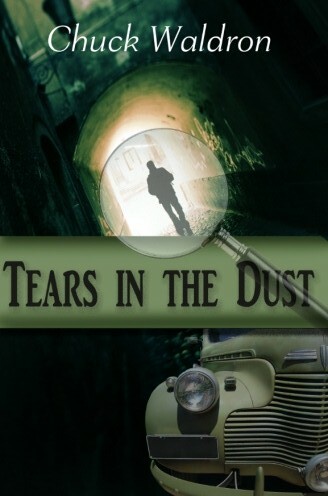 Tears in the Dust is a contemporary novel with gleams of hope intertwined within the despair of life. This is a story which serves to lift the reader up, only to take him back down into the darkness that lurks around the corners of one man’s life. Alestair “Alec” Ferguson beings a journey as a young man, off to enlist in the Spanish Civil War in 1937. Samuel T. Harrison is a dark and warped detective with a deep hatred of communism. He is the dark and violent nemesis who makes his way into the ranks of the detective agency where his boss uses his violent talents. People disappear whenever Harrison comes to town. The story chronicles Alec’s journey to Spain to fight in a war filled with personal loss and disillusionment. While in Spain, Alec falls in love with Tamarah, a convoy drive for the International Brigade. The war takes a heavy toll on Alec, and he learns just how high the cost of war can be. Disheartened, Alec fights on despite the damage done to his once strongly held beliefs. When Alec returns to his home in Vermont, seeking healing and the redemption of his ideals, what he finds there instead, causes him to flee to Canada and live the rest of his life under a false identity. But, no matter how far he goes, Alec cannot outrun Harrison, who pursues him through years and countries, only to catch up with him in a stunning conclusion to the story. You can visit Chuck online at http://www.writebyme.ca and at www.chuckwaldron.com. Visit him at Twitter at http://www.twitter.com/writebyme and Facebook at http://www.facebook.com/wordstir.